Having mocked Stephen's "absurd name," Mulligan says ingratiatingly, "My name is absurd too: Malachi Mulligan, two dactyls." Malachi (probably pronounced MAL-ə-kee, a "dactyl," rather than MAL-ə-KYE, ) is not as unusual an Irish name as Dedalus: the Irish name Malachy is a common Anglicized form of Maoilsheachlainn, a follower of St. Seachlainn. Spelled the way it is in the novel, however, it is uncommon enough to encourage a hunt for symbolic significance. The most obvious analogue makes Mulligan a messenger of God. The Old Testament prophet Malachi foretells the apocalyptic second coming of Elijah. His Hebrew name means “My Messenger,” and some biblical scholars have argued that it was not a man’s proper name at all, but a symbolic one indicating the prophet’s function as a messenger of God. Mulligan is clearly aware of this significance. In Scylla and Charybdis he borrows a scrap of paper on which to jot down an idea for a play: "May I? he said. The Lord has spoken to Malachi." Mulligan's determination to “Hellenise” Ireland arguably does make him a kind of prophet, albeit an anti-Christian one. This assumption is supported by the way the narrative presents him as the bearer of evangelical "tidings": “He swept the mirror a half circle in the air to flash the tidings abroad in sunlight now radiant on the sea.” Bernard Benstock argues that the book makes Mulligan a kind of John the Baptist to Stephen’s Christ, in the very limited sense that he appears first, dramatically preparing the way for Stephen to emerge as a character shortly after. By this logic, Mulligan’s crudely anti-Christian message could perhaps be characterized as a proclamation of Good News that introduces Stephen’s similar but much more complex and nuanced message. Later in Telemachus, Mulligan calls himself "Mercurial Malachi," and the narrative refers to his Panama hat as a “Mercury’s hat,” alluding to the famous winged hat of the god Mercury (Hermes). Since Mercury (the Roman version of Hermes) was often represented as the messenger of Zeus and other gods, carrying decrees down from Mount Olympus to human beings on earth, this detail builds upon Mulligan’s Christian name of Malachi. In combining Malachi and Mercury, Joyce was apparently paying tribute to one part of Oliver Gogarty's fanciful personal mythology. In It Isn't This Time of Year at All: An Unpremeditated Autobiography, Gogarty wrote, "It is with the unruly, the formless, the growing and illogical I love to deal. Even my gargoyles are merry and bright; my outer darkness by terror is unthronged. My thoughts are subjected to no rules. Behold the wings upon my helmet and my unfettered feet. I can fly backwards and forwards in time and space." 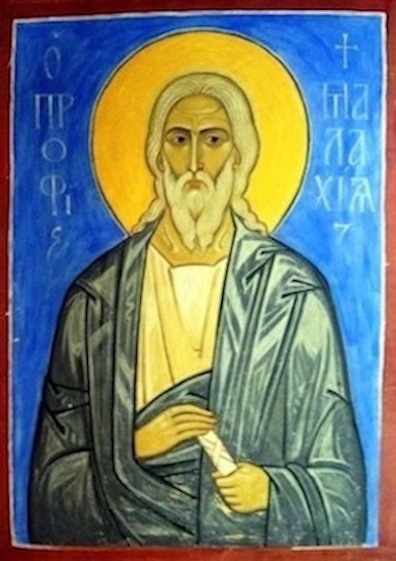 Orthodox icon of the Prophet Malachia. Source: Wikimedia Commons.